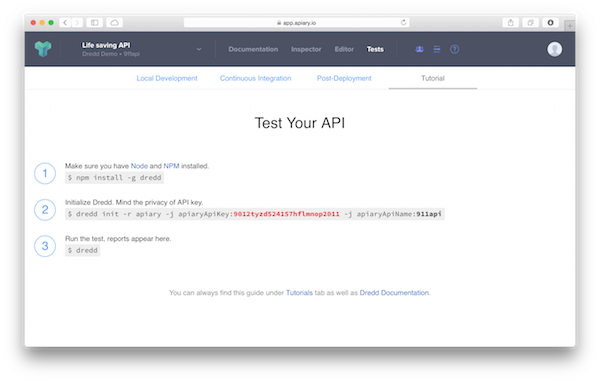 Reflecting the continued maturing of the API economy, API design tooling stack Apiary has introduced the “world’s first” continuous integration API testing service. The launch was made after user testing and feedback was received on an open source version of the project, named Dredd, after the dystopian police cop from UK comic 2000AD. Nesetril says he is seeing a sea-change in the way enterprise teams are coming together around APIs, with many moving to the sort of model spelt out by Accenture’s Teresa Tung in the Industrial API model. “I just came back from a meeting with a brand enterprise and we had 50 enterprise architects and other decision makers, all sitting around the table talking about driving consistency to make sure that everything can be built quickly, that standards are met internally: this is what it means for them to be secure,” Nesetril says. Apiary — and its Apiary for Enterprise product in particular — are built specifically around the “API Blueprint” API description format with the aim of making that industrial maturity possible. The product is gaining significant traction, and Nesetril says much of this is in enterprises who are using Apiary to describe and build internal APIs, hence his figure of 160,000 APIs built using the API Blueprint language. While much of this may be internal APIs, there are some data points that suggest API Blueprint is a popular description format amongst developers. Amongst the three most well-known description formats — API Blueprint, Swagger and RAML — API Blueprint is leading in terms of GitHub users (whether measured by those who have starred the repo, forked it, or contributed to the open source projects). 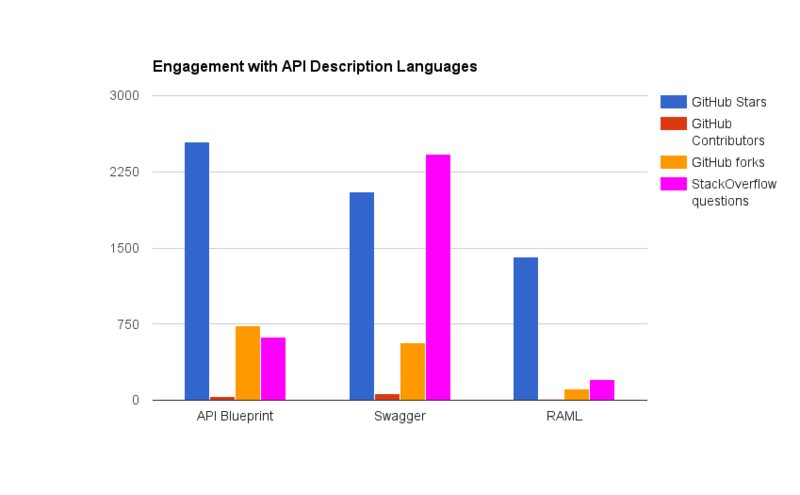 StackOverflow gives a slightly less clear picture: more developers ask questions about Swagger, but API Blueprint comes second with RAML trailing. 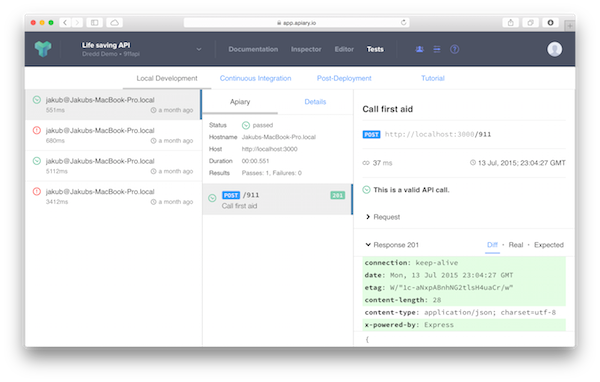 If many of Apiary’s customers are using the API design tool internally, the addition of the testing service is a crucial new offering that can help ensure an agile, less complex API data model environment. Nesetril is quick to point out that the testing service isn’t a competitor to external API ecosystem services like Runscope, which is focused on production monitoring of APIs. Instead, the testing service is aimed at automating continuous integration processes during development. “Apiary — being an API design platform — has always been able to run tests locally whenever users hit the save button, to make sure that APIs are being built to specification, that developers haven’t broken anything. Phil Sturgeon is a developer with carpooling service Ride, and author of “Build APIs You Won’t Hate.” He has been using the Dredd open source project to integrate API testing into his continuous integration workflow. “This is less about design standards — we are not using it to enforce consistent design. In our team, we have four or five people so we think we can manage in other ways. Sturgeon — who also uses Apiary’s full API design product — says that while Apiary doesn’t enforce a documentation-first design approach, it does work well within that development culture. It is an approach that other tech companies are seeing as an important way to ensure greater internal collaboration and communication. Karen Cohen, SDK Product Manager at website maker Wix made a similar comment at the API Strategy and Practice Conference in Berlin earlier this year. Apiary’s new testing service is aiming to take that sort of culture, mature it and automate it. Sturgeon says that some cumbersome tasks with Dredd have now been addressed — originally users would need to import their data, spin up a server, then shut it down after the testing. Features to automate those processes were added to a YAML file which have now been implemented as part of the product development and official release. The launch of the testing service within the Apiary product comes alongside the startup’s announcement of $6.8 million in Series A funding, which Nesetril says is the largest Series A amount given to a Czech Republic startup. According to Pavel Curda who writes for EU Startups, Apiary is one of five Czech startups to watch, all hoping to follow in Czech-tech leader Good Data’s footsteps, which according to Owler has raised $96.7 million to date. 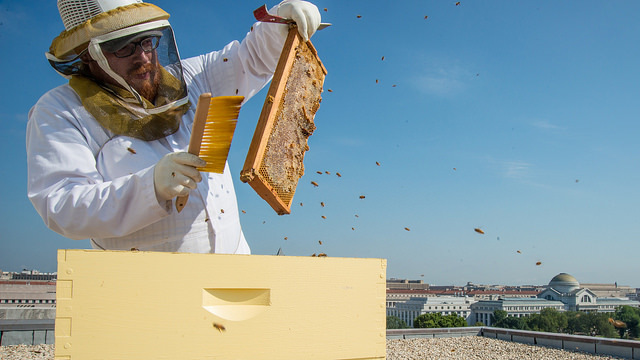 Apiary may be on a solid track: their series A funding was $0.3 million higher than GoodData’s $6.5 million Series A. Feature image: “20140905-AMS-LSC-0333” by U.S. Department of Agriculture. Licensed under CC BY 2.0.